Two-in-one: mill operations & working with mill accessories combined in one volume! 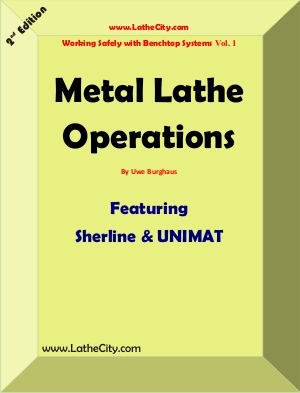 See the book review in the Nov/Dec 2014 issue of Home Shop Machinist. Citing that review "If your mill fits on a table or benchtop, you will find relevant information"
US customers. We ship USPS with tracking. Select media mail or priority mail. Synopsis: Most of us started our hobby with work on a lathe. However, the shapes than can be cut are limited. For example, basic accessories are simple to machine if a mill is at hand. Even a hobby machine shop is incomplete without a milling machine. Fortunately, quite sturdy tabletop mills are available at acceptable costs. However, none of these come with an extended manual. Mill work, on the other hand, is trickier to learn than turning. Thus, a book that describes not only the simplest operations would be useful. I did include all the standard procedures that can be accomplished just with an end mill. In addition, advanced topics are described including using a rotary table, tilt table, sine vise, form tools such as dovetail and T-slot cutters, and carbide tools for working on steel. Furthermore, the engineering background is included in plane words: up- and down-milling, work holding, indicating (measuring correctly), adding a DRO and, of course, safety concerns as well as trouble shooting. A new tool is introduced by machining a useful accessory as a project. 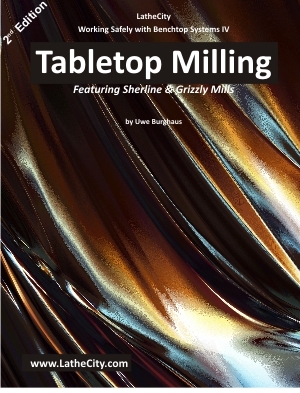 I feature again various Sherline systems, but also a larger tabletop mill, Grizzly heavy-duty bench top mill (G0720R). In addition, images and notes about full size mills are included. Although Sherline’s lathe is somewhat uncommon, their mills follow basically standard design. Thus, even if you have a different tabletop mill or even a full size system, the described procedures will be (nearly) identical on your milling machine. 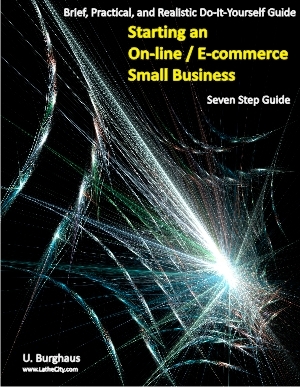 The background of the cover image of this book is copyright by bigstockphoto.com and licenced to LatheCity.